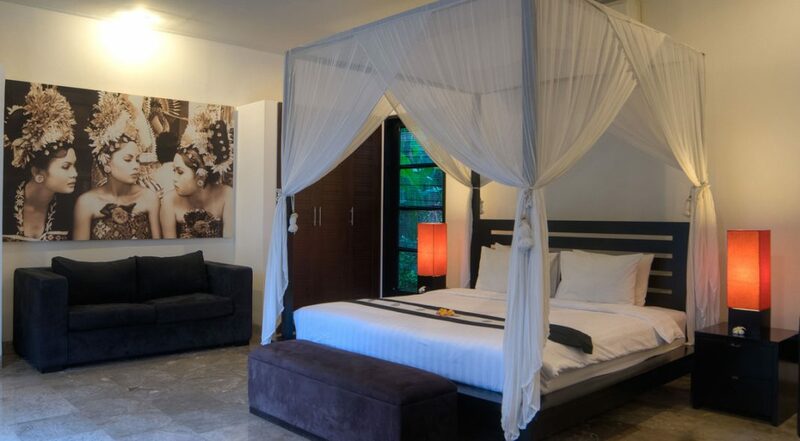 From $ 627AUD per night We have direct contracts with most villa owners. We don't add any booking fees. We are 100% transparent with no nasty surprises. 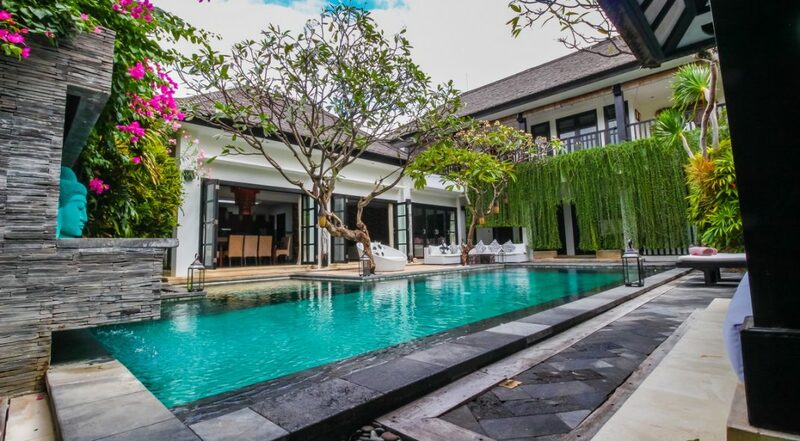 The exclusive private villa estate “The Residence Seminyak” is where you will discover the delightful 4 bedroom Seminyak holiday villa rental, Villa Senang. 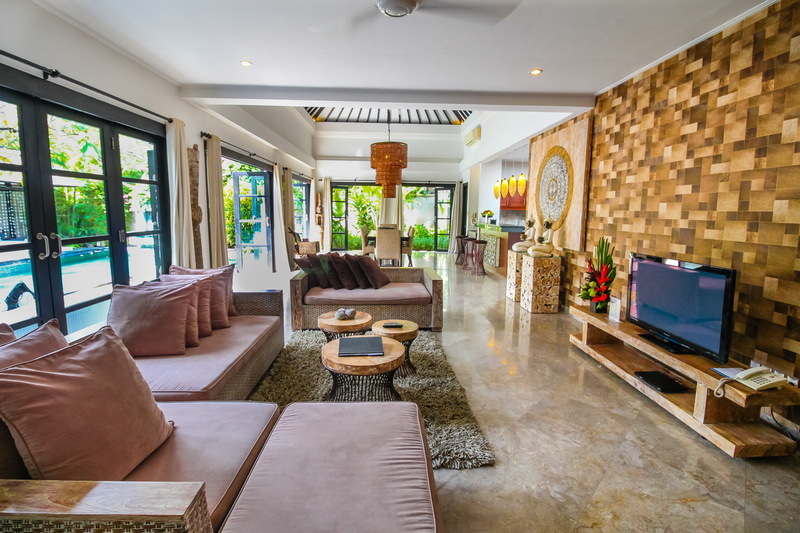 Built over two storey’s this modern holiday villa accommodates up to 8 guests, featuring spacious living areas, a private pool and a 24-hour concierge service as well as round the clock butler services. 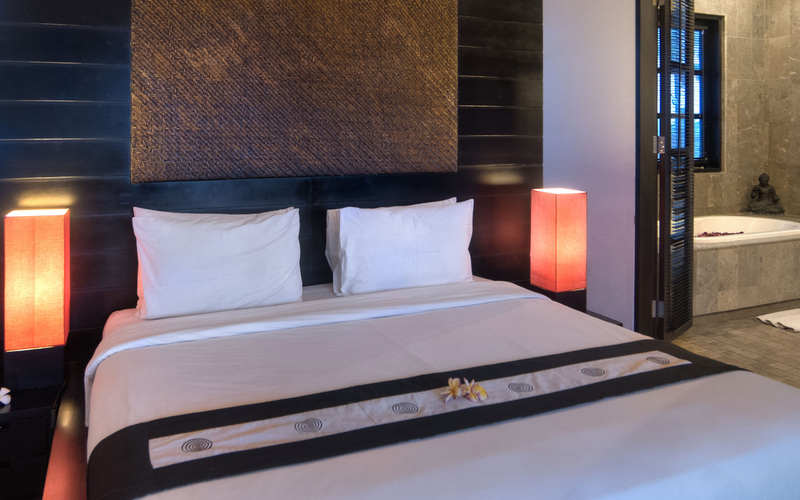 Located just 5mins from Seminyak’s famous Oberoi Street guests will have full access to all the most popular restaurants, cafes, bars, yoga studios, day spas and beach clubs. 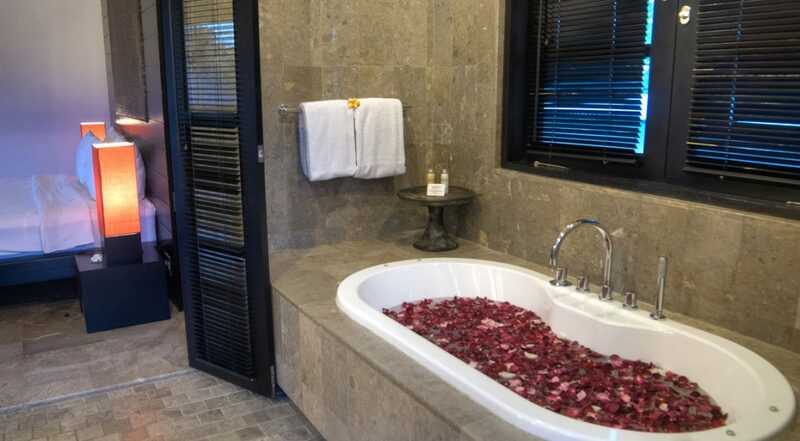 The use of natural stone around the crystal clear waters of your private pool is a tribute to the designers. 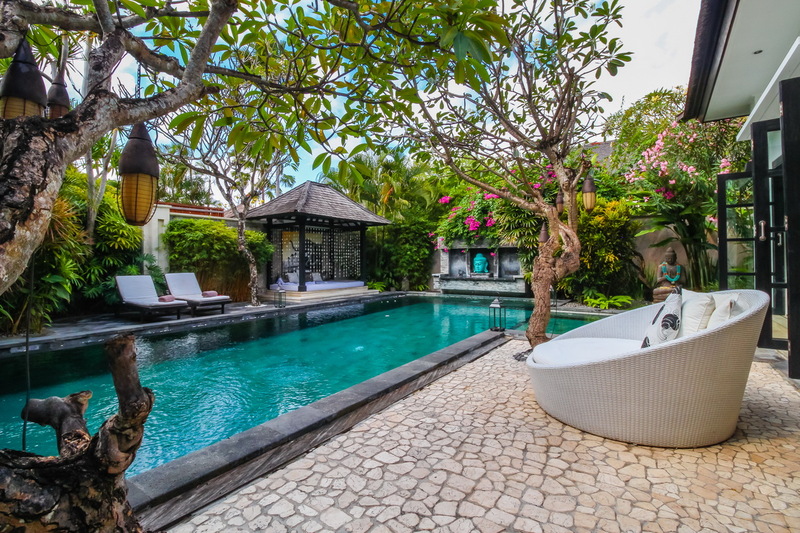 Vibrant bougainvillea hangs above the Buddha water feature at one end of the pool and a delicate frangipani tree quietly emits its fragrant scents as you relax on one of the pool side recliners. 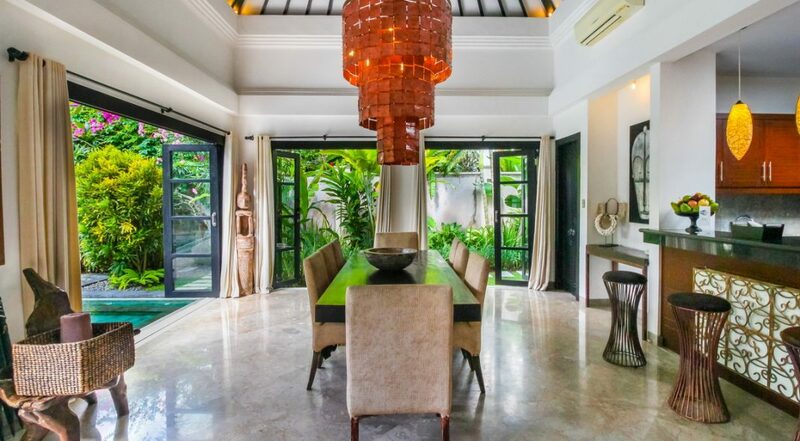 A lush tropical creeper hangs from the upper balcony, the perfect backdrop to the comfortable outdoor rattan lounge, ideal for poolside relaxation. 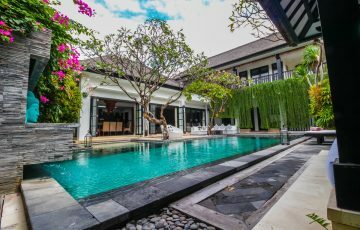 The villa really is ideal for a large family or group of friends with its large living areas tastefully decorated with hand-crafted furnishings, antique items and pleasant Balinese artworks that adorn the walls. 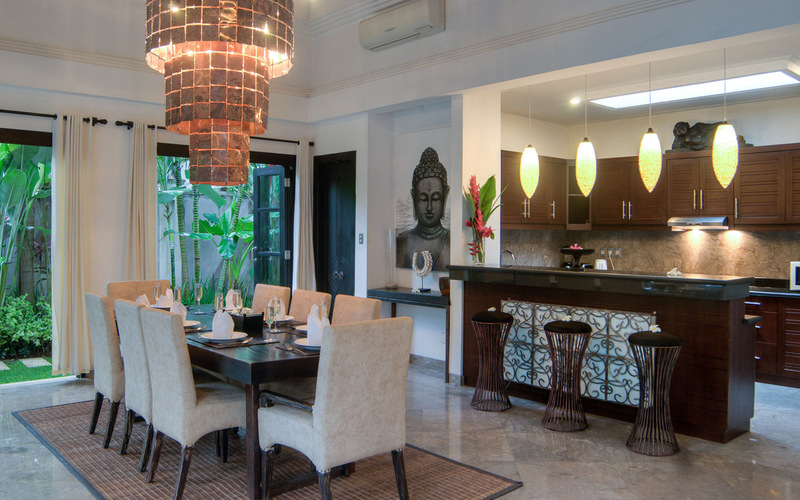 The 8 seater dining table is set just inside by the pool so you can open the doors to enjoy the tropical warmth as you dine with the family. 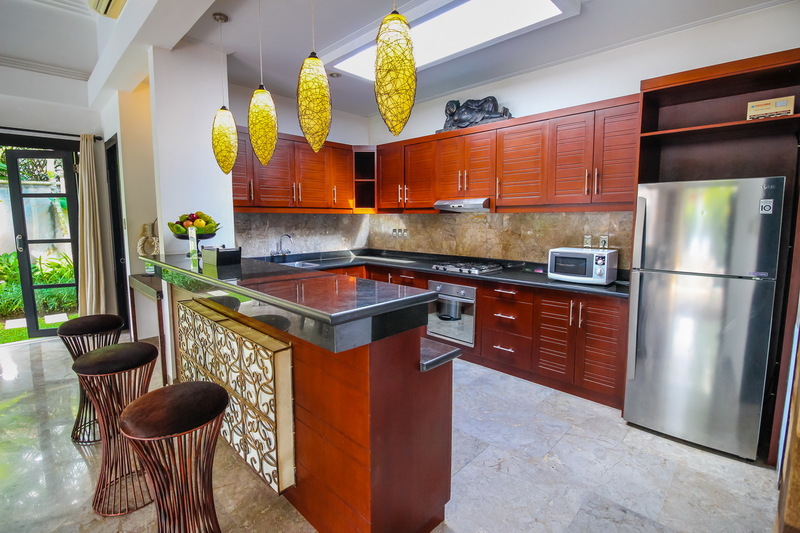 The kitchen has absolutely everything you will need whether you want to do some of your own cooking or have the private chef come and take care of things for you. 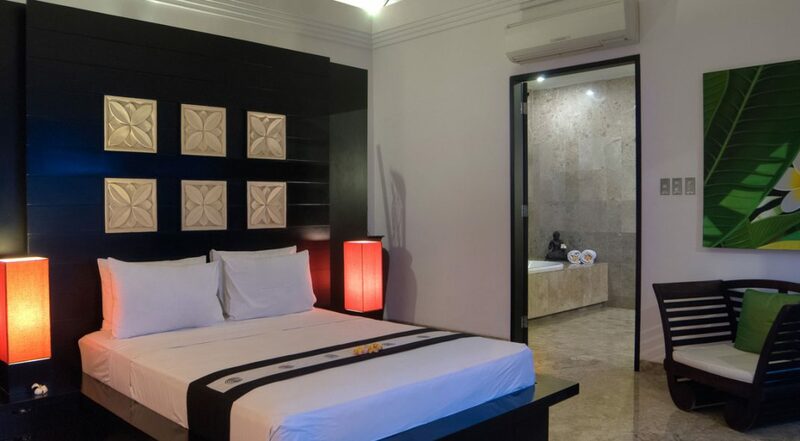 The bedrooms are fitted out in beautiful marble flooring, the master suite and a second guest bedroom offer king size beds while the remaining two guest suites, queen sized beds. 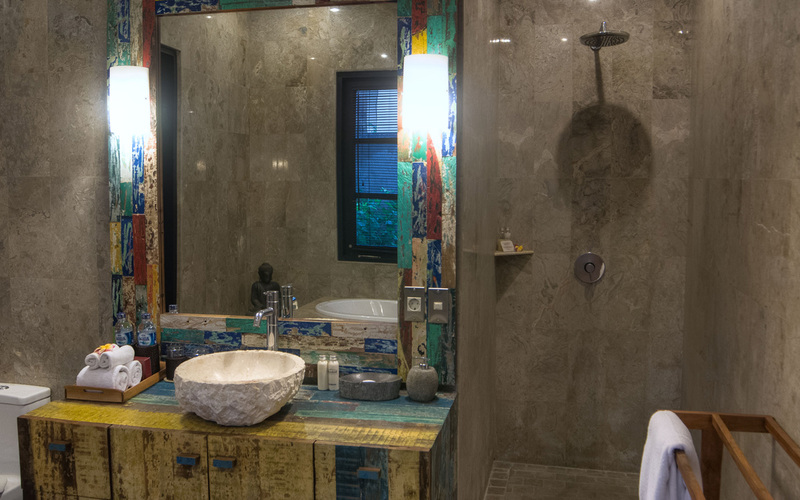 The private en-suites feature a xix of huge soaking tubs and spacious rain showers for some self indulgent pampering whenever you feel like it. 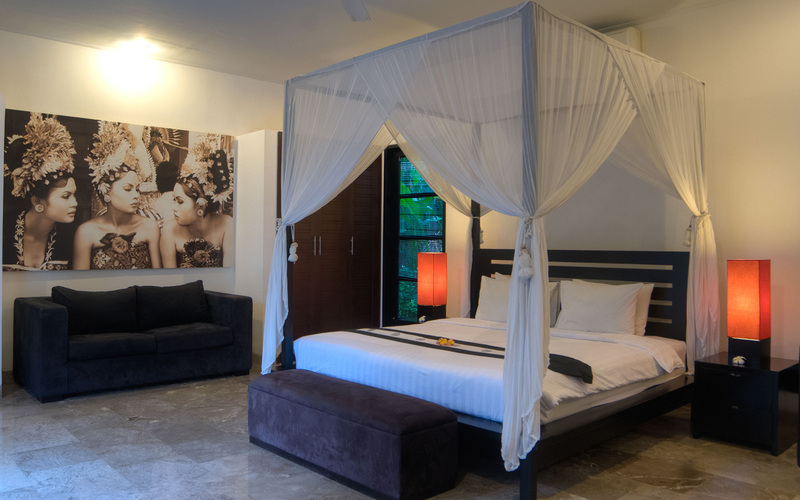 The rooms are air-conditioned and have all the modern amenities for absolute comfort. 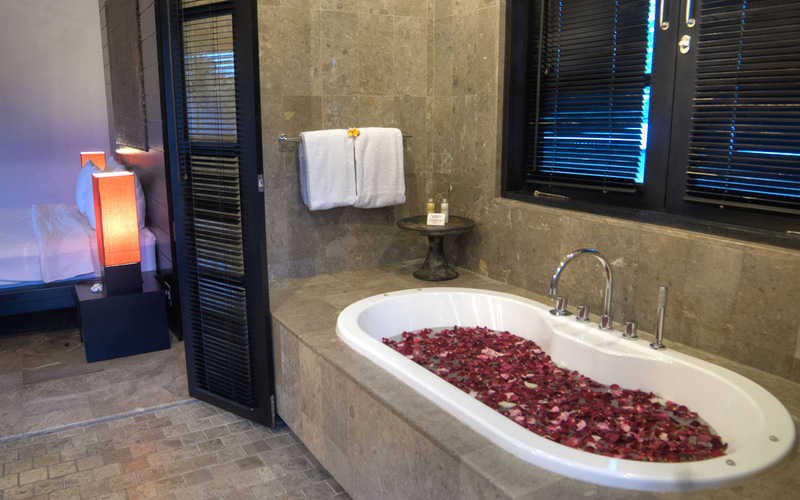 The Residence private estate provides guests with full-time security, total privacy and a 24-hour concierge service so you guaranteed to be really well taken care of by the team of dedicated and professionally trained staff. 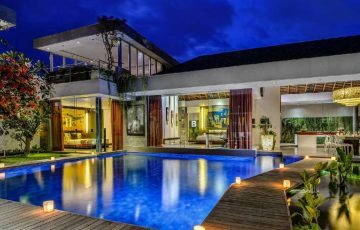 The villas estate offers a fantastic central Seminyak location with some great restaurants in your street including Settimo Cielo for tasty Italian cuisine, Happy Chappy’s for great Chinese dining and Nirvana Sports Bar and restaurant on Eat Street for a fantastic family dining menu. You can easily walk to Grocer & Grind and Sisterfields for great breakfasts and all day grazing and Motel Mexicola or the Champagne Bar is the perfect place to have a drink after dinner. The beach is within easy walking distance where you may care to treat yourself to an amazing meal at La Luciola, right on the beach! Definitely come down here for the sunset. If your coming with the children make sure you take them to the Waterbom Park or the Finns Recreation Club which is a short taxi ride away. 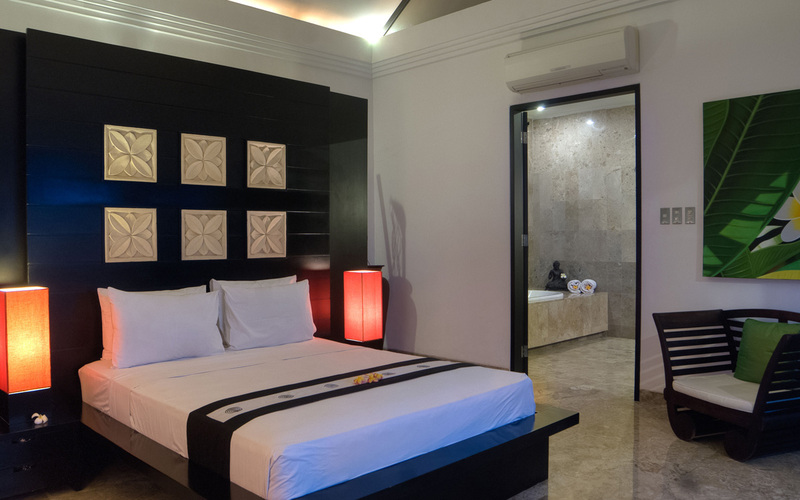 To view other 4 bedroom Bali villas or to see more family friendly Seminyak villas near Eat Street please contact our reservation team or browse this website. 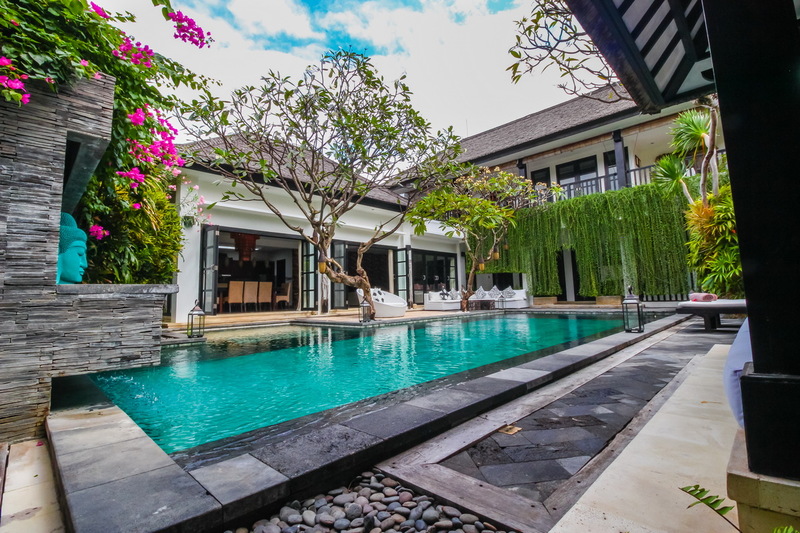 This is a popular family friendly Seminyak holiday villa rental so please book Villa Senang well in advance, especially if you are planning a trip to Bali during the Australian school or public holidays. My families first impression of Senang was wow! I am pleased to say that this is how we felt the whole 10 days staying in this awesome villa. 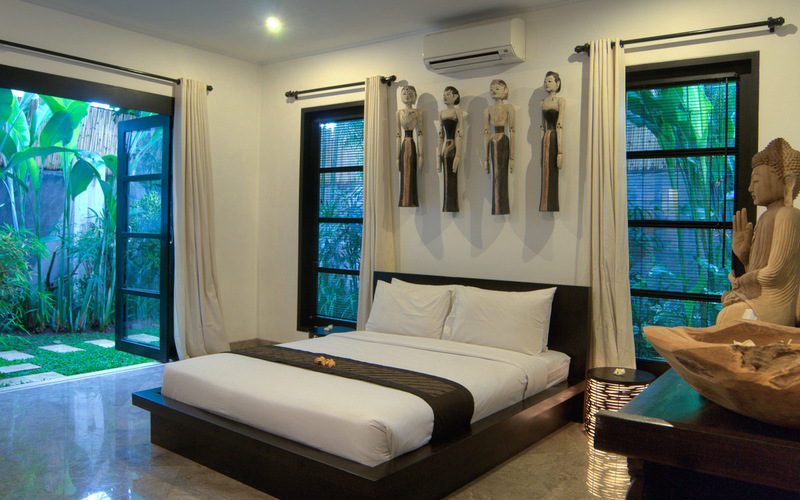 The location was very central right in the heart of Seminyak and the villa facilities were perfect for our family. 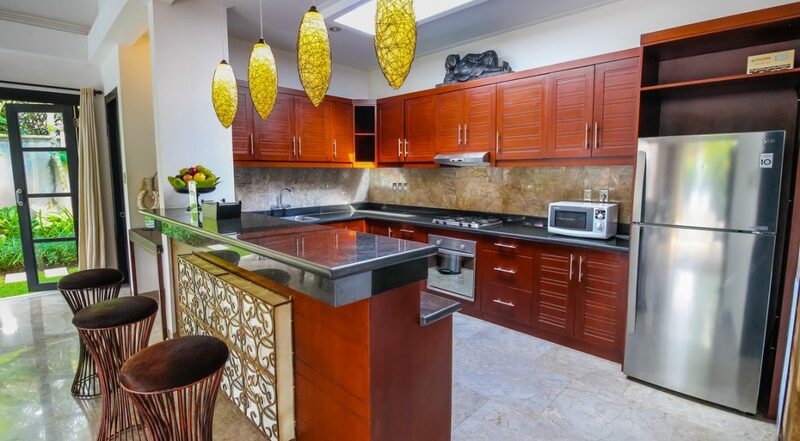 The staff were always on hand to cook and clean the villa and they even organised our dinner reservations. 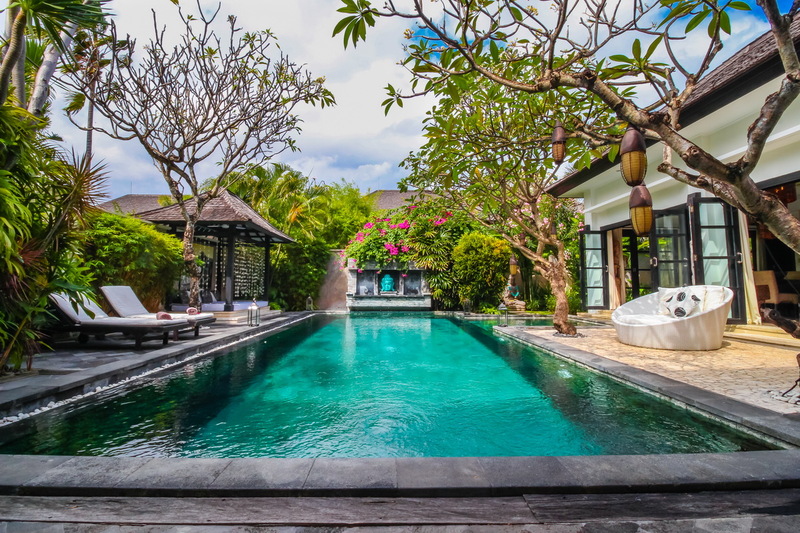 The pool and garden area were also meticulously maintained and the kids loved playing in the pool while we were content to relax and soak up the great villa atmosphere - it really felt like a home away from home. Looking forward to coming back again! 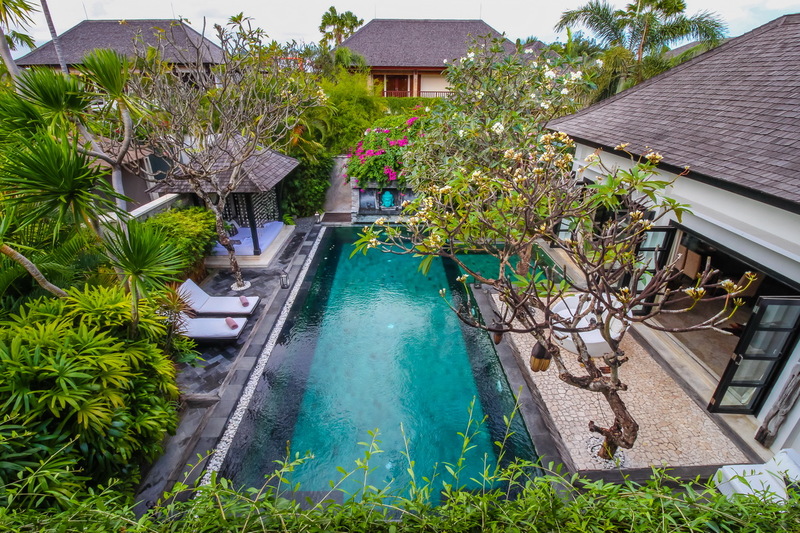 Thanks to Dewi and Ina at Bali Villa Escapes for organising this so quickly. 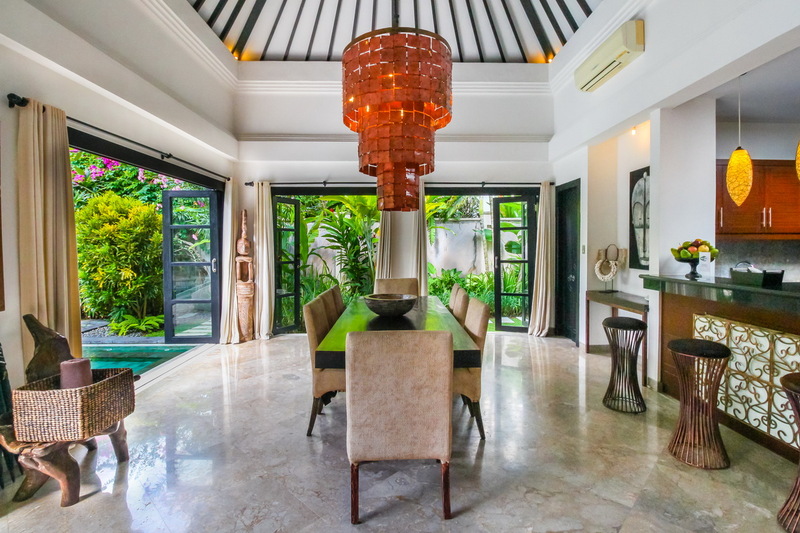 This villa is great value and in a fantastic Seminyak location - we loved being able to walk to the restaurants nearby at night. Most of them were close to Seminyak Square which we could walk to in 5 minutes. 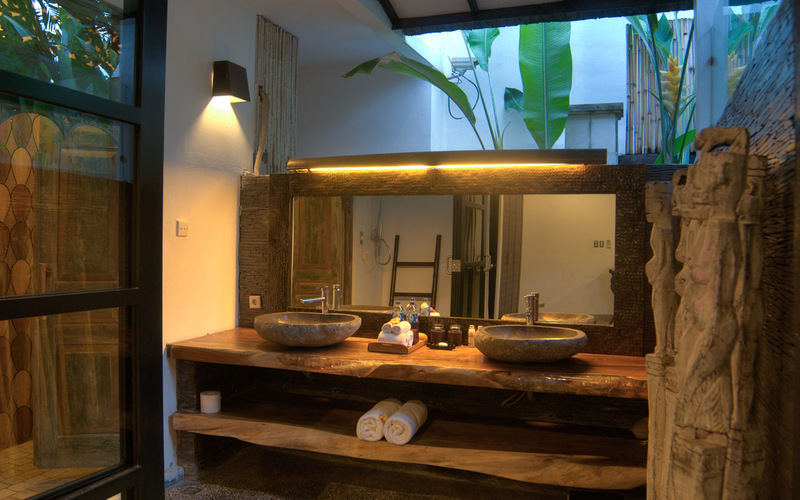 The villa was immaculate and everything was cleaned daily by the Balinese girls - this was really handy as I was here with 3 children who did make a mess. We all loved the pool area especially lounging around doing basically nothing except watching the kids have a fabulous time. 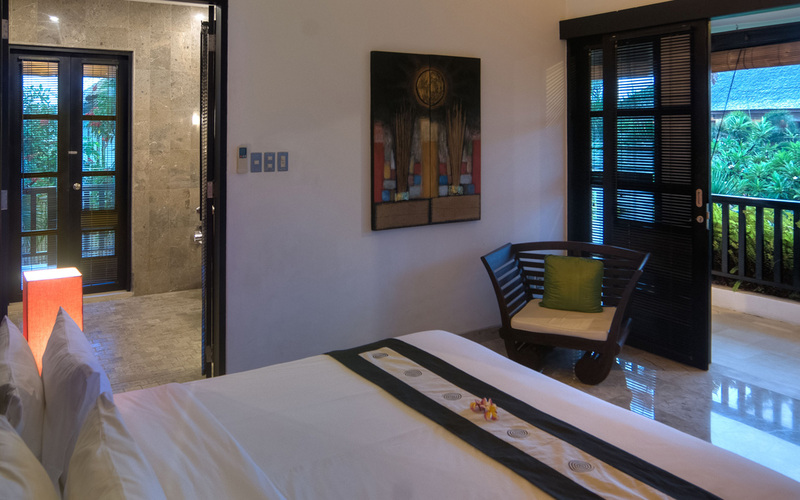 This is a wonderful villa and we would have absolutely no hesitation in recommending it for a great holiday experience. Fabulous villa with everything at our doorstep - the family took daily trips to the beach nearby where we spent most of the morning. Afternoons were all about the villa, the swimming pool and just relaxing. Can't wait to get back here and do it all over again! 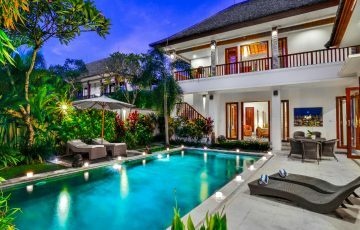 Top Villa with a perfect beach side location. The staff were there to greet us when we arrived and make us feel immediately at home - plus we really liked the airport pick up. Getting a taxi would have been a nightmare. Following on from that the 10 days we spent here were absolute bliss. 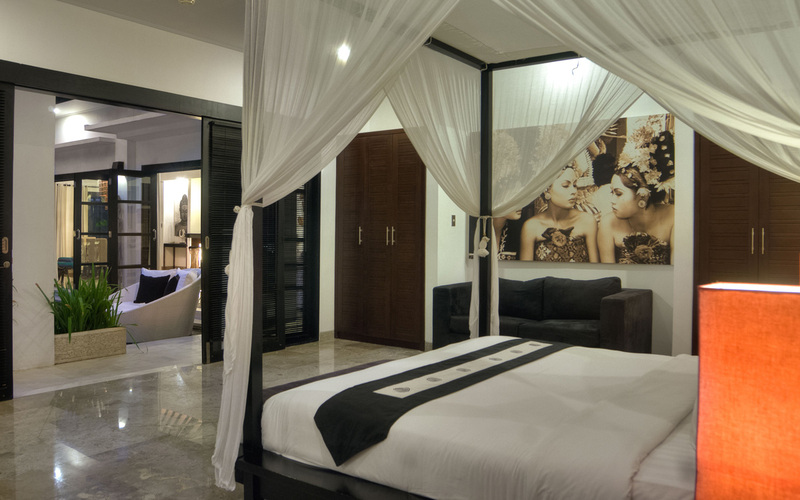 All we can say is this is a great villa with top facilities - give it a try you will love it! 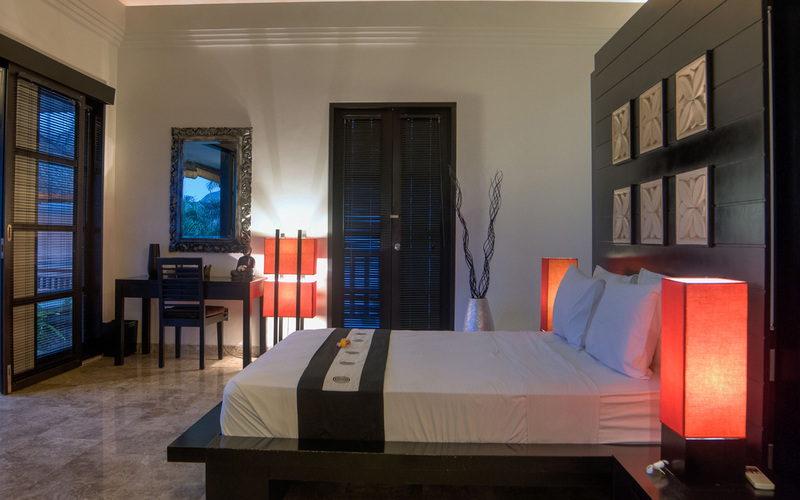 We easily give it a 10 out of 10 for it's value for money, prime location and super friendly villa staff. An fun packed week, tasty breakfasts, incredible staff who were happy to organise anything we needed including transport and scooter hire. We are coming back with the kids again for sure. 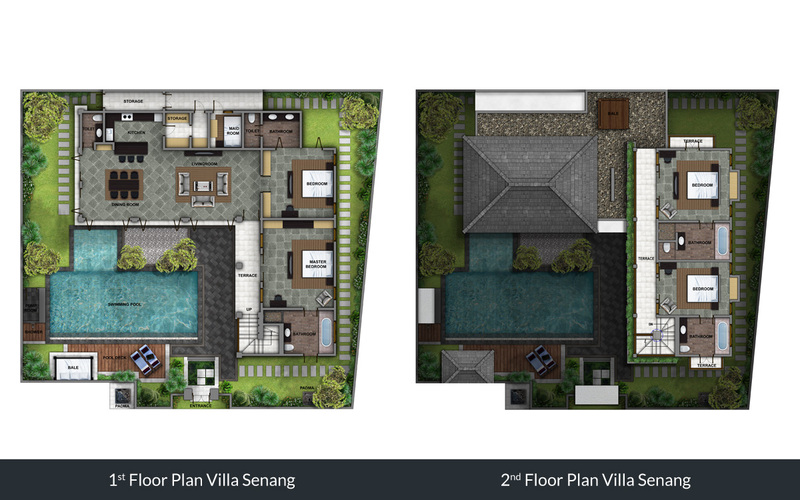 When it comes to location Villa Senang is unbeatable. Eat Street and Seminyak Square were around the corner. 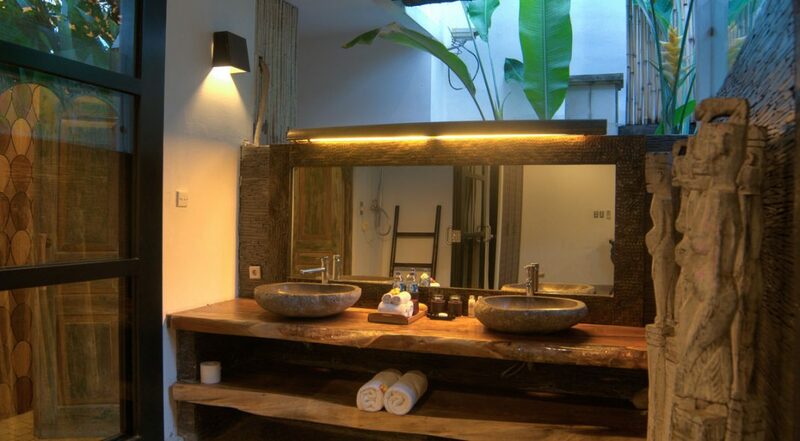 Fabulous fit out, accommodation staff and a wonderful spacious feel. More than happy to recommend. 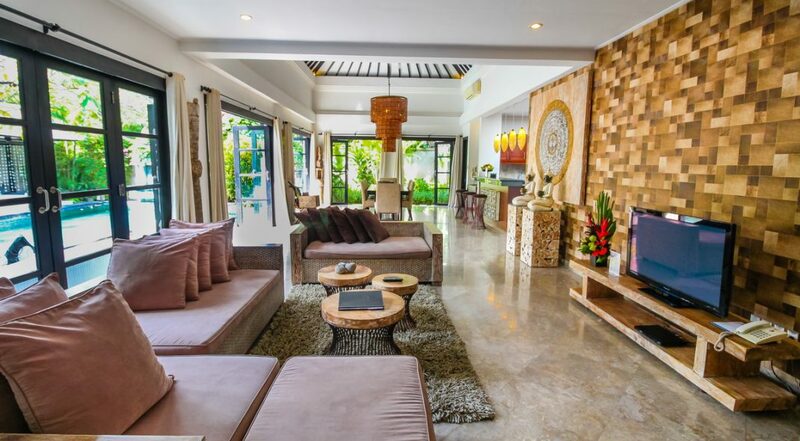 Fun times in a lovely villa. Definitely coming again next year. 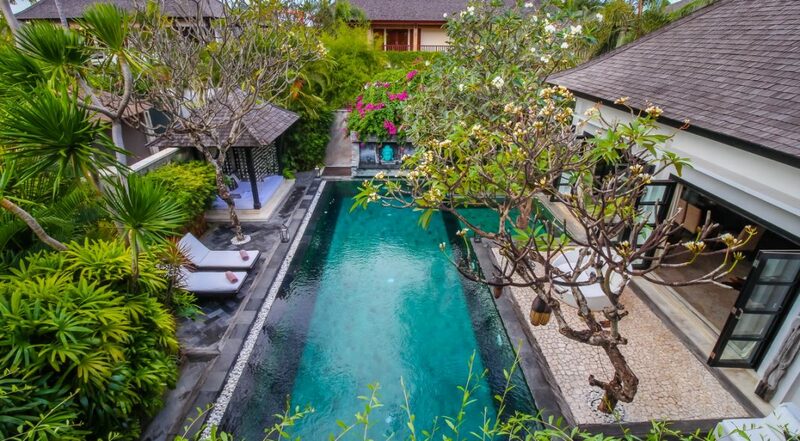 To Lily and Putu and the rest of the staff at Villa Senang, thanks for an incredible holiday.